The thigh has a special weight and a precise cover of fat, to allow the long curing process. 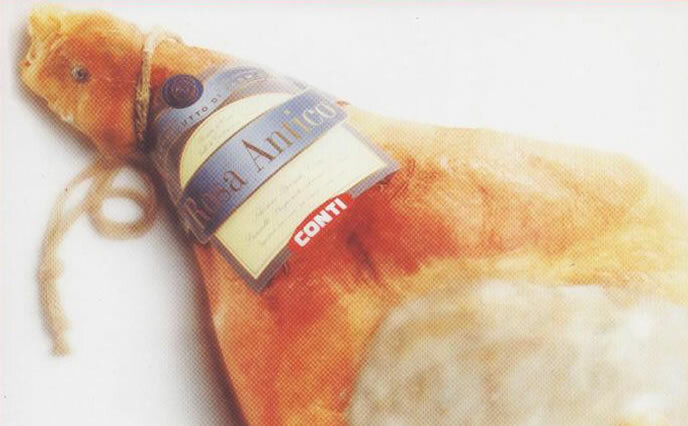 The product is aged for at least 16 months. Its taste is sweet but strong and its fragrance palatable and persistent. 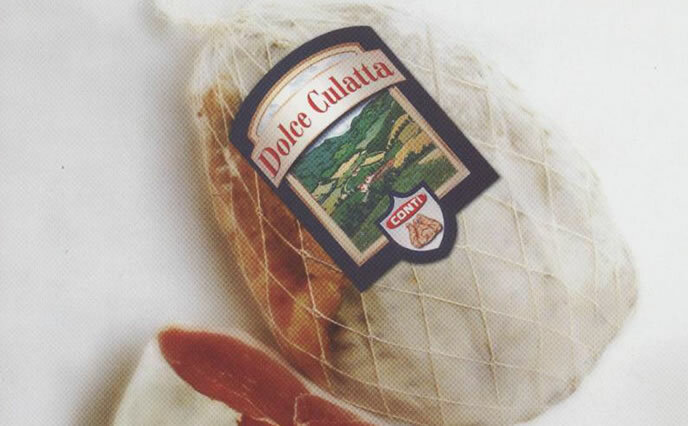 Raw Material: it comes from Italian breeding farms and slaughter houses. Thighs arrive to the factory fresh, conveniently cooled and trimmed. Curing: at least 16 months. It depends on the piebald marking. Pleasant flavor and live fragrances. On the surface the product has a golden cotenna-skin, a scarce light yellow fat crown, but it is white if there is the bone. Internally, the fresh is bright red and the fat is white. Curing: at least 13 months. It depends on the sorting. 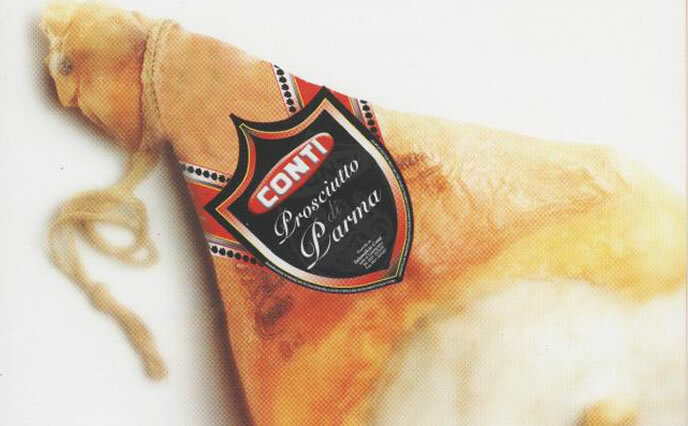 Culatello with the pork rind of the hill is produced with the precious part of the Italian pork’s thigh and has a white fat. Raw Material:it comes from Italian breeding farms and slaughter houses. Culatelli arrive to the factory fresh, conveniently cooled and in part covered by the pork rind. Curing: at least 12 months. It depends on the piebald marking. Pleasant flavor and live fragrances and aromas of the spices. Externally the product has a golden cotenna skin, a scarce light yellow fat crown and it is covered by spices. Internally, the fresh is bright red and the fat is white. 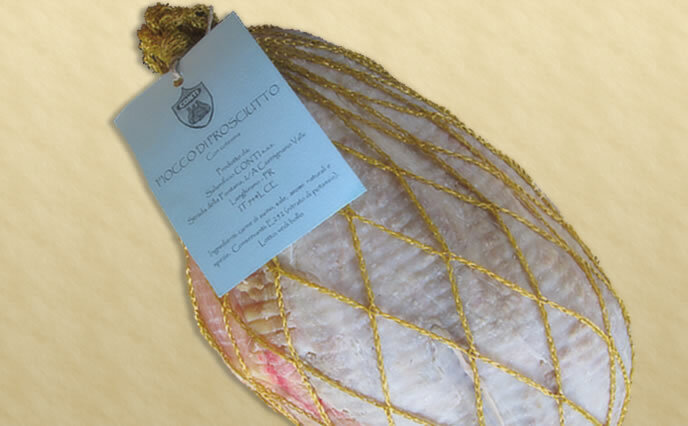 Fiocchetto from the hill, aged with the cotenna skin, is produced by the lowest-fat part of the thigh of the Italian pig that is enclosed by a thin and soft contour of fat. 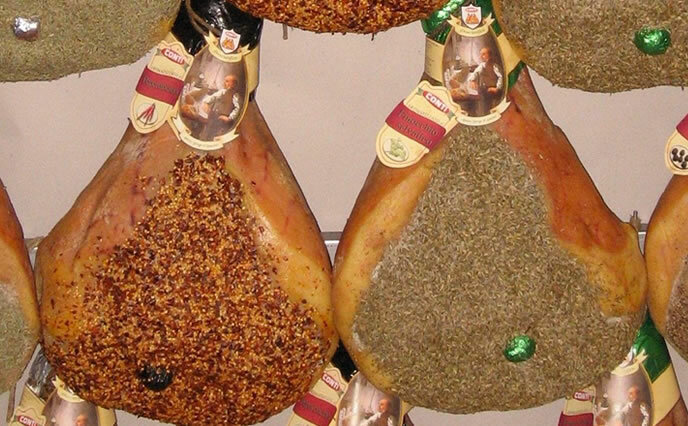 This product of high quality is made with a little salt and a secret mixture of Mediterranean aromatic herbs. Raw Material: it comes from Italian breeding farms and slaughter houses. 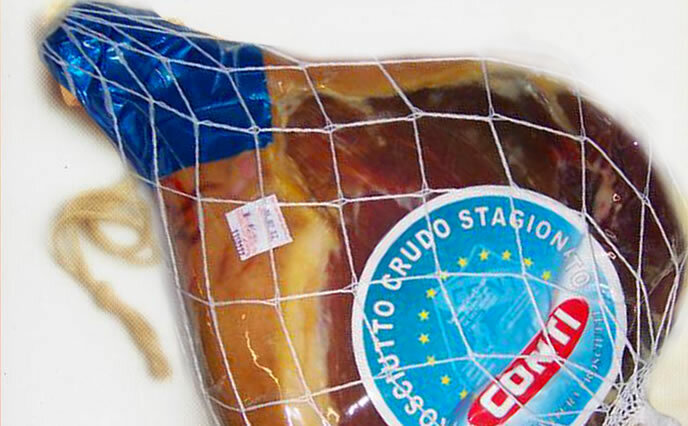 The meat arrives to the factory fresh, conveniently cooled and partly covered by the cotenna skin. Curing: at least 10/12 months. It depends on the piebald marking. Pleasant flavor and aromatic fragrances. Externally the product has a golden cotenna-skin, a scarce light yellow fat crown, but it is white if it is on the bone. Internally, the fresh is bright red and the fat is white. Curing: at least 10 months. It depends on the piebald marking/sorting.